I had one more full day of eating ahead of me and a week’s worth of suggestions clanging around in my brain. Knowing we were going to end the day with an epic meal at Au Pied du Cochon, I knew we could only choose a couple of places to eat at to round out my Montreal experience. 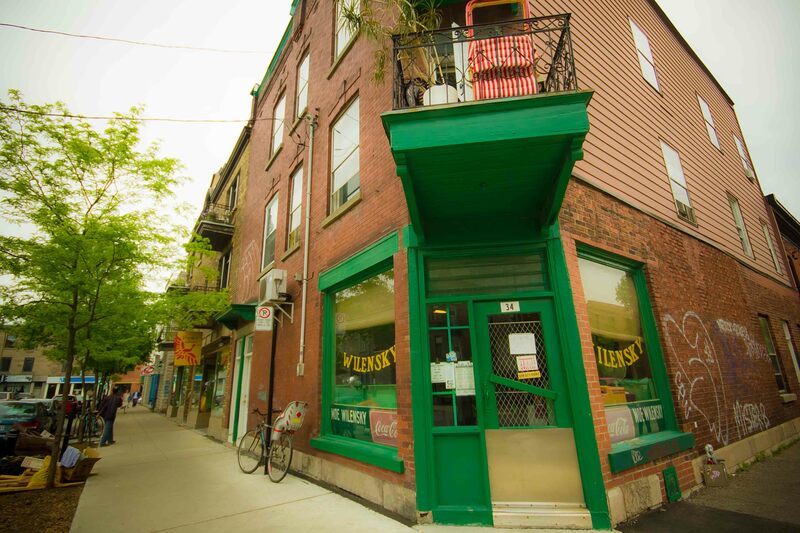 I knew about Wilensky’s from David Chang & Anthony Bourdain’s shows and was mildly curious about their bologna sandwich. I didn’t think I could convince Ben to go out of his way for a bologna sandwich, so I didn’t add it to my itinerary. But then we were told of Wilensky’s delicious homemade cherry cola. When I heard about that, I really wanted to go, unfortunately I didn’t look up the hours beforehand to see it was closed on Sundays. My disappointment didn’t last long because we continued down the block to Fairmont Bagels. A warm bagel to start the morning seemed just right. It wasn’t long before we entered the shop and I was engulfed by the heat from the oven which distracted me from getting a good look at the worker-bees pumping out the fresh bagels. Luckily, the line went so quickly that before I knew it, we reemerged onto the street with a bag of bagels and a tub of cream cheese in hand. 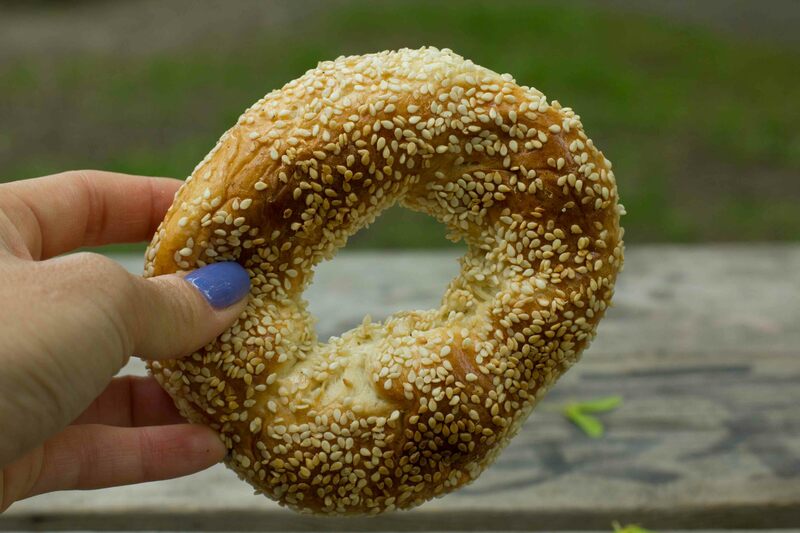 We quickly made our way to a nearby park to devour our bagels. Still warm from the oven I loved the crispy bite that led to the sweet, chewy middle. 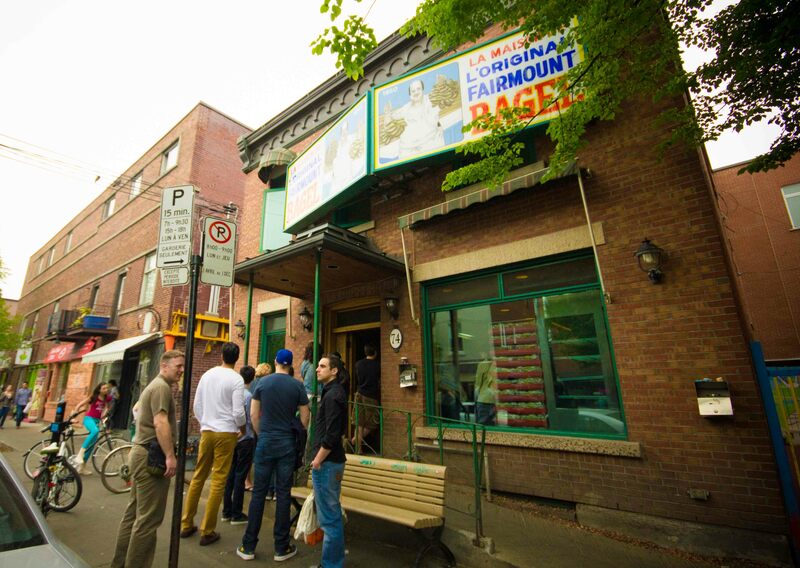 I know that doing the side by side taste test of Fairmont bagels vs St Viateur is the thing to do. But I couldn’t rationalize the amount of carbs that would be consumed by doing such a test only to come up with the probable result that they were very comparable. Besides, I knew we had plenty of calories left to consume in the day as we continued on the journey to our next destination. 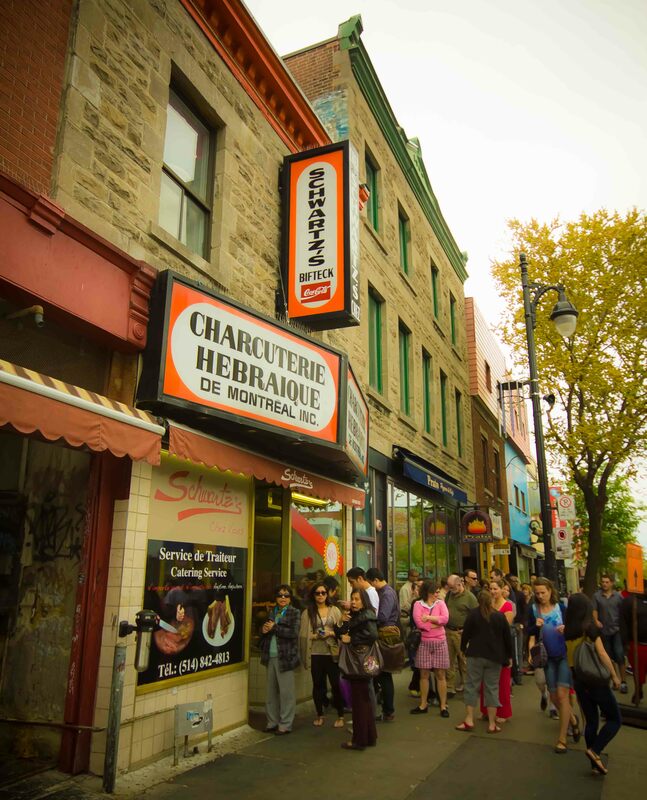 A food lover’s visit to Montreal wouldn’t be complete if Schwartz’s wasn’t on the list Going to Schwartz’s for a smoked meat sandwich was the most recommended thing from all of the suggestions I received. But as we walked towards it, I knew I wasn’t going to wait in the outrageous line to get in. Luckily the line on the take-out side seemed more manageable. After a half an hour wait, we had our sandwiches in hand and our plan was to go back to the hotel to eat them. Halfway there, I couldn’t stand waiting any longer, so we sat down on a bench and ripped the bag open. We ordered one medium and one fatty sandwich. Much to my surprise, I thought the medium one was more tender and delicious. 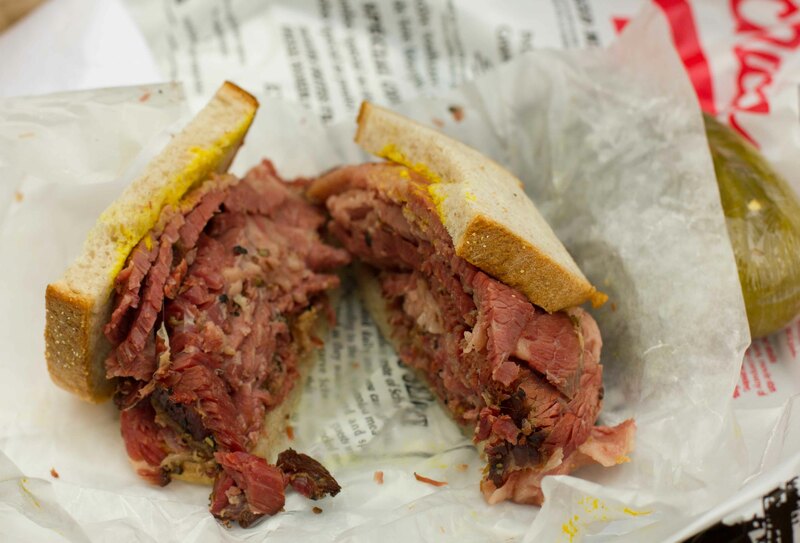 Katz’s pastrami (NYC) vs Schwartz’s smoked meat? Well unlike the bagels, I can put my 2 cents in, (or at least do so from my food memory) and I say Katz’s. While the meat at Schwartz’s may be more flavourful, I enjoy the texture and taste of the pastrami at Katz’s and their bread, mustard and pickles are head and shoulders above. And I’m sorry, but Cott Black Cherry Cola is gross compared to Dr Brown’s. Some may complain and say I’m comparing apples to oranges because pastrami is not the same as smoked meat. But seeing as they’re both forms of smoked meat, I’d say it’s more like comparing a Red Delicious to a Gala Apple. Both are good, but in a side by side test, I’m picking the Gala every time. So while I can profess that I had a delicious smoked meat sandwich from Schwartz’s that I’d go out of my way for, when I’m in New York, I’m running to Katz’s every time. I feel a bit of shame, writing this post about Schwartz’s and not bring any smoked meat home for my dad. I did think about it at the time, but wasn’t sure I’d be allowed to take the somewhat liquid-y shrink-wrapped pack in my carry-on. Actually looking back now, I would have made a lot of people happy if I returned home with a side of meat from Schwartz’s. Maybe the next time someone is coming from Montreal to Vancouver, you can pick some up for me?